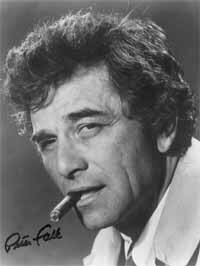 Peter Falk, better known to TV fans as "Columbo" from the series of the same name, has died. He had been ill for some time and was 83. Falk was a good friend of Patrick McGoohan and the pair of course worked together several times, with McGoohan both starring in and Directing several unforgettable episodes of the series that made Falk a Worldwide name. McGoohan won two Emmy awards for his work on the series. A full obituary can be seen HERE. TUW extends its sincerest sympathies to Peter's family, friends, and many fans.....'Just one more thing..."
With thanks to Tom Meyer, Brian Watson, and Catherine Frumerman for this news item.